Sarah Nader - snader@shawmedia.com Head softball coach Dwain Nance speaks during a reception to celebrate the Class 3A state softball championship Monday, June 19, 2019. The Indians won their second state title in seven seasons under head coach Dwain Nance. Sarah Nader - snader@shawmedia.com Marengo's Leah Secor (left) and Mariah Dionne listen to the head softball coach speak during a reception to celebrate the Class 3A state softball championship Monday, June 19, 2019. The Indians won their second state title in seven seasons under head coach Dwain Nance. 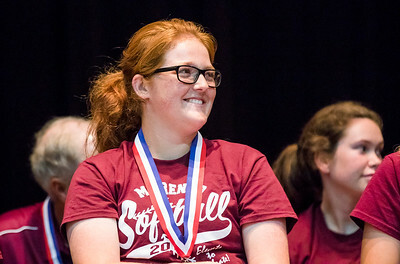 Sarah Nader - snader@shawmedia.com Marengo's Megan Anthony listens to the head softball coach speak during a reception to celebrate the Class 3A state softball championship Monday, June 19, 2019. The Indians won their second state title in seven seasons under head coach Dwain Nance. 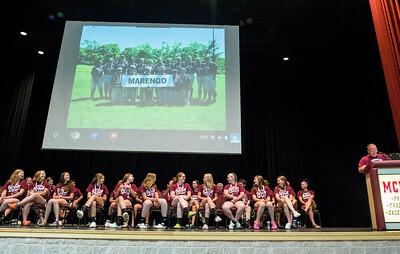 Head softball coach Dwain Nance speaks during a reception to celebrate the Class 3A state softball championship Monday, June 19, 2019. The Indians won their second state title in seven seasons under head coach Dwain Nance.